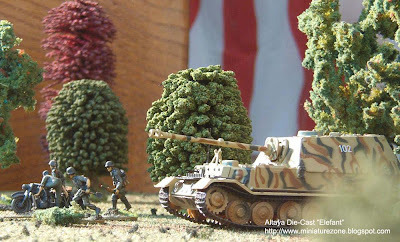 Thought I'd post a photo of one of the new Altaya ready-made-n-painted 1/72 German tanks in action on the wargame table. This model above, the "Elefant" tank, was in newsagents at a special introductory offer of Eur 2.95. And of course I bought three......... well, for that price who wouldn't ? Then, once the mist had cleared from my brain, I thought what on earth do I want three Elephants for. Still, I suppose will use the three together in a game one day.